One photograph makes it abundantly clear just how present a small group of Goldman Sachs alumni has become in Donald Trump’s White House. From April 6, it shows a stone-faced Trump and his advisers in a “sensitive, compartmented information facility” at Mar-a-Lago, just after the president had given the order to launch cruise missiles at a Syrian-government airbase. 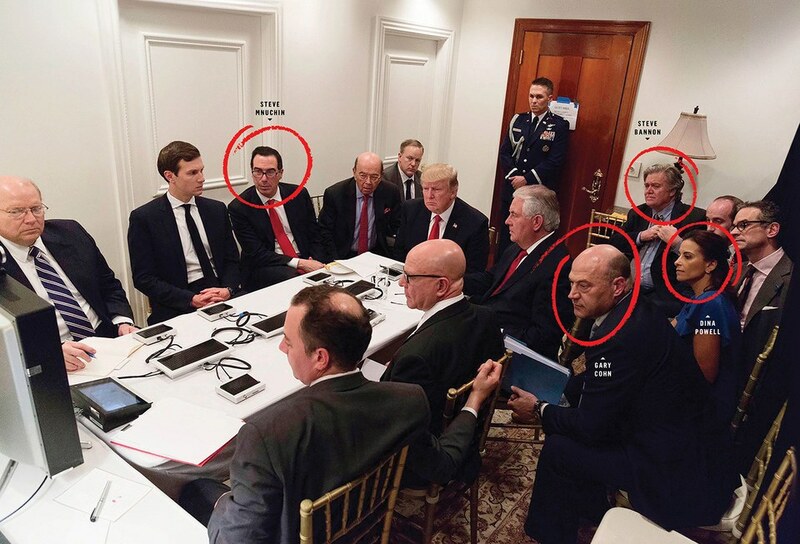 In the closely cropped picture, released by Press Secretary Sean Spicer on Twitter, 14 men and one woman are crowded tightly around a small table, their eyes glued to a closed-circuit-television screen. Three of the people in the picture—Gary Cohn, the head of the National Economic Council and Trump’s chief economic adviser; Steve Mnuchin, the Treasury secretary; and Dina Powell, a deputy national-security adviser—are former Goldman Sachs partners, one of the most coveted perches on Wall Street. A fourth, Steve Bannon, Trump’s chief strategist, was a Goldman Sachs vice president in the late 1980s, before he left the firm to start his own investment-banking business. It is also interesting that Cohn is confirmed dyslexic (which Trump probably is also). I am told Trump is also a careful listener. In the end, this an Administration that appears to be a combination that either can't read or is "content-lite" but certainly knows how to do crony deals---and Goldman Sachs people are over the place in the can't read, content-lite department to stick handle the deals in front of the likely dyslexic Trump who doesn't like to read either. This is still a tough one for me. Come back to Earth, Evan.